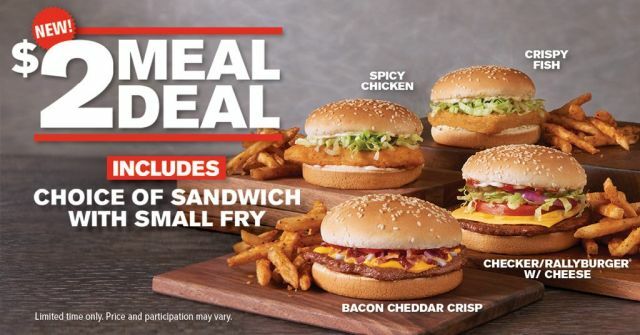 For a limited time, Checkers and Rally's are offering "new" $2 Meal Deals featuring a choice from four sandwiches served with a small order of seasoned fries for $2. The sandwich choices are: Spicy Chicken, Crispy Fish, Bacon Cheddar Crisp, and Checker/Rallyburger with Cheese. The restaurants have offered a $2 Meal Deal before but it looks like they're calling it "new" this time around due to the different sandwich choices. Prices and participating for the deal may vary.